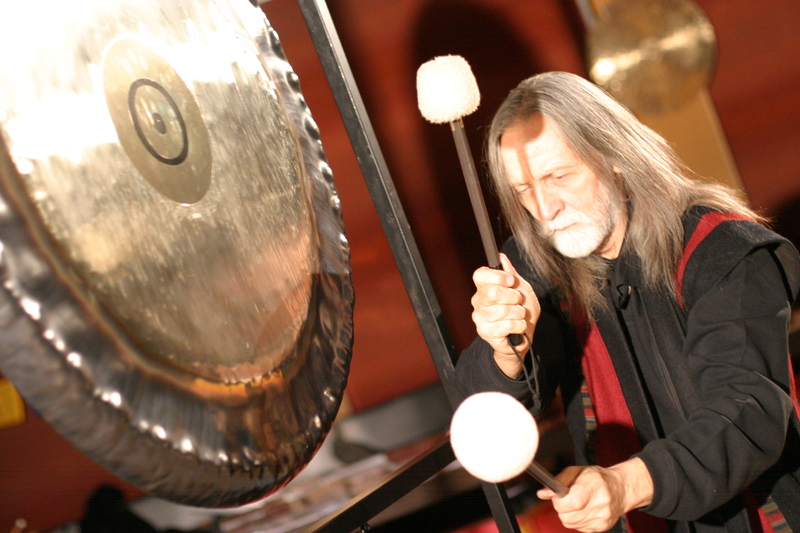 Don is the originator of Gong Yoga, The Gong Bath, Gong Therapy, Gong Puja, Gong Master Training, the Global Gong Network, the Global Gong Mantra Sutra, and he is conductor of the Mysterious Tremendum Syntonic Ensemble, as well as, the designer of Starhenge World Peace Bell Gardens. There are now two Starhenges in Poland, one in the U.K., another one in Portugal and another in the state of Kansas, U.S.A. He has been travel extensively since 1984 and today hundreds of his Way of the Gong students are doing Gong Work and World Service in many countries around the world. His gong teachings are now being presented in an accredited course at the College of Sound Healing in the United Kingdom. For the past 40 years, Don Conreaux has brought the mystical and entertaining sounds of the ancient bronze gong (tam tam), bells, bell bowls, shofar and the spiral sea horn (conch) to millions of listeners around the world. He has appeared on numerous television and radio programs as performing artist and talk show guest, holds 2 degrees in Theater Arts. Mr. Conreaux has worked throughout his career in theater, in both film and television in Hollywood as an actor, writer, and director before arriving in 1984 to NYC. “The bronze gong has since ancient times been thought to exemplify the sounds of the universe; the sacred conch suggests the sounds of whales, elephants, dolphins, and wolves.” These sounds summon the forces of nature,” offers Mr. Conreaux. He is a genuine Gongmaster, as well as artistic director of The Mysterious Tremendum Consort and School of Sacred Sound. Previously he performed as an original member of One Hand Clapping, the Tibetan Singing Bowl Ensemble. Don Conreaux tours worldwide, offering instruction, discourse, retreats, and full-evening concerts. Promoting the gong and its direct relationship to stress reduction and subsequent healing. The role of tone vibration is underscored as a tool for expanding awareness and global unity. Conreaux teaches the art and science of the gong, sacred conch playing, archaic polyphonic chanting and several other ancient tone producing instruments with The Mysterious Tremendum School of Sacred Sound and Intuitional Gong Yoga is “a school without walls”. As a writer, actor and director in theater, Mr. Conreaux was greatly influenced by Alice A. Bailey’s Esoteric Sound Healing, as well as Gene Youngblood’s writings on the subject of visually induced synesthesia. In 1969 he produced and directed the first of his “Concerts For Humanity” which was called The Divine Union, where he used for the first time, the ancient bronze gong with its powerful ‘layering tones’. Theatrically he was impressed by Gratowsky, and musically marked by composers Rudhyar and Scriabin. While on a Gandhi Salt March across the US, he met Robert Muller of the UN and was struck by Muller’s First Day of World Peace Concept and the simultaneous ringing of the multitude of gongs and bells on our planet. Conreaux’s interest in ancient geomantic power-points, sacred geometry, and the inherent power of social rites, such as musical ceremonies using recycled implements of war, brought on the vision of designing special acoustic spaces utilizing principles of ‘functional harmony’ which empower the collective mind to cooperate non-violently with each other. Most significantly, his Mysterious Tremendum Syntonic Consort can also be understood as a resonant tribute to Dane Rudhyar and to Russian composer Alexander Skriabin’s vision of a ‘Mysterium’ in which he attempted to “re-tune the world”.